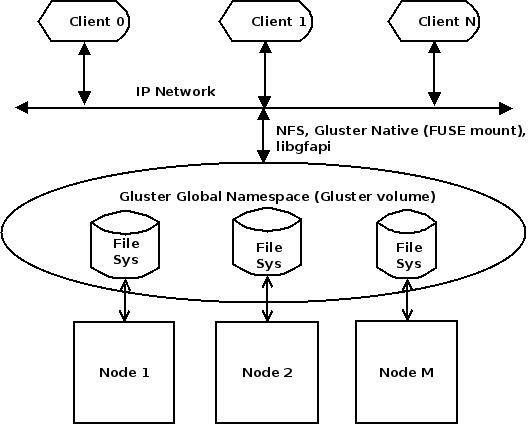 way to access GlusterFS namespace is via FUSE based Gluster native client. More information on creating and mounting GlusterFS volume can be obtained from GlusterFS website. – A new library called libgfapi is now available as part of GlusterFS that provides POSIX-like C APIs for accessing gluster volumes. libgfapi support will be available from GlusterFS-3.4 release. – QEMU (starting from QEMU-1.3) will have GlusterFS block driver that uses libgfapi and hence there is no FUSE overhead any longer when QEMU works with VM images on gluster volumes. 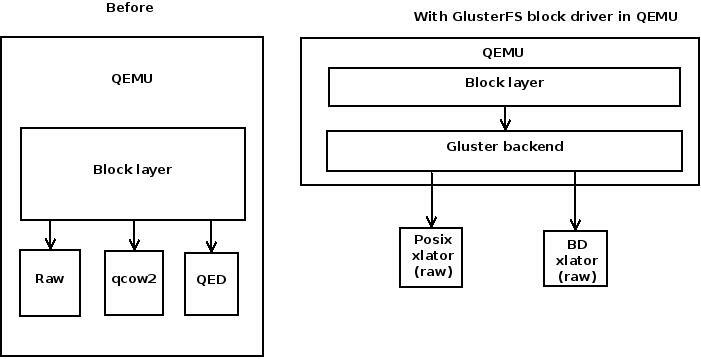 GlusterFS with its pluggable translator model can serve as a flexible storage backend for QEMU. QEMU has to just talk to GlusterFS and GlusterFS will hide different file systems and storage types underneath. Various GlusterFS storage features like replication and striping will automatically be available for QEMU. Efforts are also on to add block device backend in Gluster via Block Device (BD) translator that will expose underlying block devices as files to QEMU. This allows GlusterFS to be a single storage backend for both file and block based storage types. transport specifies the transport type used to connect to gluster management daemon (glusterd). Valid transport types are tcp, unix and rdma. If a transport type isn’t specified, then tcp type is assumed. server specifies the server where the volume file specification for the given volume resides. This can be either hostname, ipv4 address or ipv6 address. ipv6 address needs to be within square brackets [ ]. If transport type is unix, then server field should not be specified. Instead the socket field needs to be populated with the path to unix domain socket. port is the port number on which glusterd is listening. This is optional and if not specified, QEMU will send 0 which will make gluster to use the default port. If the transport type is unix, then port should not be specified. volname is the name of the gluster volume which contains the VM image. image is the path to the actual VM image that resides on gluster volume. Without this, GlusterFS driver will not be compiled into QEMU even when GlusterFS is present in the system. Here a-data.img from datavol gluster volume appears as a 2nd drive for the guest. The following numbers from FIO benchmark are to show the performance advantage of using QEMU’s GlusterFS block driver instead of the usual FUSE mount while accessing the VM image. While I described how to use GlusterFS as a storage backend for QEMU manually, there have been efforts to enable QEMU-GlusterFS native support from libvirt, VDSM and oVirt as well. We now have GlusterFS enabled completely from oVirt which allows user to use self-help portal of oVirt to create GlusterFS volume and use it as storage backend to host VM images. The GlusterFS storage domain work in VDSM and the enablement of the same from oVirt allows oVirt to exploit the QEMU-GlusterFS native integration rather than using FUSE for accessing GlusterFS volume. Deepak C Shetty has created a nice video demo of how to use oVirt to create a GlusterFS storage domain and boot VMs off it. UNMAP support in QEMU-GlusterFS is explained here. This entry was posted on Monday, October 29th, 2012 at 10:42 am and is filed under Technical. You can follow any responses to this entry through the RSS 2.0 feed. You can leave a response, or trackback from your own site. Thank you ! very helpful for me. my qemu version is 1.2.5 and gluster version is 3git latest(Oct 30). – Not sure about 1.2.5 version of QEMU, the latest I see is 1.2 and a few rc versions. Can you please test with latest QEMU git tree ? – Looks like latest GlusterFS has problems and I am also seeing similar errors as you (glfs_creat in libgfapi is failing). I will debug this further and get back to you. I downloaded qemu source from github( https://github.com/qemu/qemu.git ) and branch is master. I tried to find QEMU-1.3 you said, but I couldn’t find. Where can I download QEMU-1.3? I will also debug my environment ~. QEMU-1.3 is not yet out and hence latest QEMU git from the URL you point out is good enough. As I said I am seeing some problems with latest GlusterFS which I need to debug. Will get back to you after that. SungWoo, Please use –enable-uuid (and also –enable-glusterfs) when you configure QEMU. This will ensure that “qemu-img create …” works correctly. I omitted -enable-uuid because of configuration error. I install libuuid-devel and configure again with enable-uuid. It would be good to add a short summary after the FIO numbers table, so that readers don’t have to calculate how much the improvement is in their minds :). It also helps people ina hurry to quickly read the summary instead of deciphering the numbers 🙂 – just a thought. Thanks deepak. Deepak – Re-generated the numbers with latest QEMU & GlusterFS and added a column that shows the % change. Thanks for your suggestion. What if I want to execute qemu-img or qemu-system-* gluster:// *as non root user*? I tried to fusemount volume and change permissions/acl/ownership on mounted dirs, or even to change them in /export/brick, but it doesn’t work. There’s a way to “authenticate” via gfapi? Am I supposed to necessarily run qemu as root if I want this feature? Well, thanks. I wanted to run qemu as non-root for security reasons… but setting “allow-insecure” means that I am completely missing my goal, isn’t it? Well, perhaps I’ve found a better solution. I’m still experimentig with it, so the usual disclaimer applies 🙂 And any comment is welcome. First, I can certainly run qemu-img as root with no worries: it’s a command I run just once, not a long-standing process – heavily accessing system resources – like QEMU itself. Then, I can fusemount the gluster volume and change ownership of the image. (Possibly chmod’ing it to 0700). (At this point, I can safely unmount gluster-fuse, I don’t strictly need it anymore). Finally, I run qemu as root, but with the -runas option: which means that qemu initially acts as root to talk to the gluster daemon, but later it loses superuser privileges and it’s still able to write to the image it owns. (Er, the image mode could be 0600 of course, not 0700, no need to be executable 😉 sorry). This doesn’t happen if i run QEMU on a FUSE mount! Is this – somewhat – “by design” (i.e. If I want such optimization, the good practice is to shutdown VM before each brick management operation) ? Is this a QEMU bug? A Gluster (or, more specifically, a libgfapi) bug? Last I checked, there were a few issues related to replace-brick being done with libgfapi. Can you please take this discussion to gluster-devel mailing list so that we can hear the latest on that ? I have successfully created image using qemu-img info on gluster volume, using this qemu glusterfs driver. But I need to use this image to create a VM. I see in your example, that you use qemu-system-x86_64, but usually I use “virt-install” python wrapper. I need how to make use of this image using virt-install command. Please provide me the info. Mistake to be corrected in my comment, its “qemu-img create” and not “qemu-img info” to create a image. I don’t use virt-install, but I believe virt-install doesn’t support GlusterFS protocol specification in libvirt XML. Could you elaborate on your setup? How many disks? What kind of disks? Sebastien – I am only comparing FUSE vs libgfapi FIO numbers for which I have given the setup information in the blog itself. So you’ve done everything locally? However you never specified the individual disk speed, so we can’t really interpret your results. So, is there a way to delete the image that is already available on gluster volume, without mounting the volume, either by fuse or NFS ? Like all other block drivers in QEMU, GlusterFS driver too supports only creation of file on the (GlusterFS) backend. Deletion should be handled outside of QEMU which means it should be done via NFS or FUSE for GlusterFS. I believe your Q is wrong. Its like asking how i can use qemu to delete a file if the file was present on the gluster mount point. You cannot do that but yes since its a gluster mount, u can do a ‘rm’ to delete the file. Similarly in ur case its accessed via libgfapi, so you can write a small program that links with libgfapi and sends a ‘unlink’ fop to the file u r interested to delete. Qemu libgfapi integration isn’t meant to provide way to manage files on glusterfs, its a way to access files so that files on gluster volume can be used as vm disk images. If you Q was how to remove a vmdisk (backed by glusterfs usign libgfapi) from the VM’s config, you can use virsh detach-disk or detach-device. Again it only removes the gluster-backed-disk from the VM’s config, not from the glusterfs backend. Thanks Deepak for explaining. I was looking for a way to unlink a file without mounting it. That was my intention behind this question. To add few other perspectives…. 2) Typically file create/delete is a storage backend operation while qemu usign a file is a virt operation which are managed by storage and virt admins resp. who have separate roles, resp and permissions in a production setup. Even in openstack, we use cinder to create/delete volumes (files on glsuter backend) and then attach / detach the volumes to nova (VM/instance). Allowing qemu to create/delete files on storage backend is like mixing the virt and storage admin roles/resp./permissions which can cause issues. They are best when kept separate. For eg: In openstack setup, cinder gluster backend is setup for access only for cinder:cinder but qemu process (i.e nova instance) will be running qemu:qemu creds and thus won’t have perms anyways to create/delete files on glsuter backend which is set to cinder:cinder. This is done deliberately so that any file create/delete only happens via cinder as it knows best how to deal with gluster (or any other stoarge) backend. Bharata, may seem like a simple question but how did you compile QUEMU. Did you pass any special parameters. Can you please provide the command you used. That improvement in speed is very impressive. I knew I wasn’t a fan of FUSE, but didn’t know by how much. Now I do.